In partnership with The Commons, the Spencer Museum of Art presents the nationwide public art project Pledges of Allegiance, commissioned by Creative Time, a New York–based public arts non-profit. The project is a serialized commission of 16 flags, each created by an acclaimed artist to reflect the current political climate. Click here to learn more. 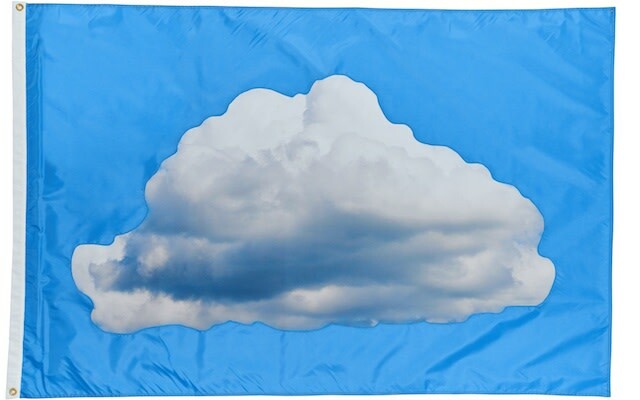 On the image, Vik Muniz’s Diaspora Cloud, which features a cloud floating against a blue background and cites an earlier work of Muniz’s, which was commissioned by Creative Time: Clouds, (from 2001), a “low tech illusion,” wherein clouds were “drawn” over the Manhattan skyline by a crop-dusting plane re-worked for skywriting. Diaspora Cloud, in title and image, may suggest a geographically and temporally dispersed public coming together to imagine new, if ephemeral, forms of community.